Moosehaven, the "City of Contentment," 70 beautiful acres on the shore of the broad St. Johns River in Orange Park, FL, 15 miles south of metropolitan Jacksonville. 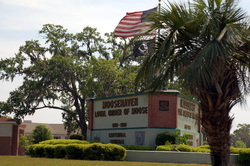 Founded in 1922 by the Moose fraternal organization, Moosehaven has provided thousands of Moose members and their spouses with a secure, relaxed, and enjoyable retirement experience. Moosehaven residents enjoy their beautiful community without the burdens of home maintenance. Health care is comprehensive, and transportation is readily available -- as are plenty of social interaction and activities. In fact, residents often find themselves so involved at Moosehaven, an oft-heard comment is, "We wish we'd moved here sooner!" For nearly 90 years, the Moose fraternity and Moosehaven have continued to demonstrate an abiding concern for the well-being of Moose members and their spouses in the twilight of their lives. And, with the addition of new and exciting living options coming soon, Moosehaven again evidences its commitment to provide a quality lifestyle with continued care. Please contact us if you would like to donate to this charity or click here for more information.